There are a wearying amount of musicians out there who, subscribing to the cult of Ariel Pink, seem to think that badly-written pop songs will magically become brilliant if they sound like they were recorded on a battered 4-track. To most people with a brain this cosmetic formula is patently bogus. Still, judging by the amount of people attempting to bind their music between the squidgy flaps of sow’s ears by with a reel of worn cassette tape, the fallacy has yet to be noticed by many. The key, whether you’re recording in Abbey Road or onto a sheet of soot-coated paper, is the quality of the music. 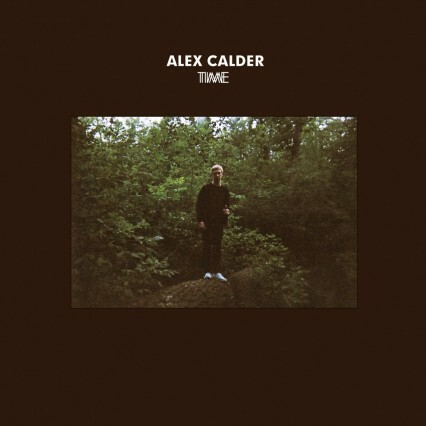 This is why Alex Calder‘s “Time” EP stands out so vibrantly amid a sea of similar-sounding toss. Whereas others use a lo-fi asthetic to disguise the flaws in their songwriting, Calder employs home-recorded warmth to enhance what are already fantastic songs. Reverb is used to make things sound deeper rather than just bigger, semi-intelligible vocals conjur mystery rather than mumblewank, and instruments are subtly detuned to create a specific atmosphere rather than just out of fecklessness. Well, that’s all conjecture to be fair. Maybe he’s actually just a lazy chancer and the fact “Time” sounds so good is just a beautiful fluke. Maybe it wasn’t really recorded at his Mum’s in Edmonton (the shithole in Canada rather than the shithole in London) but in a multi-million dollar studio. It doesn’t really matter when the music is this good. The opening track has a brief, reversed intro that suddenly explodes into probably the record’s best piece. Indie music rarely takes you to another world (and when it does it’s often a more boring one), but ‘Suki and Me’ really takes you elsewhere. It’s like being shot into space in a bathtub. The jangly ‘Light Leaves Your Eyes’ is less dynamic but still delightful, harnessing the sedate sounds of Real Estate but scratching off their sometimes slightly synthetic sheen. At other points they sound like a smoother, less slapdash Sic Alps, with ‘Location’ throwing punches of guitar that should sound jarring but instead retain a natural fluidity. It’s the sort of music you’d want to listen to while walking through woodland after recent rainfall, all wet leaves and stinking bark. Then there’s the appropriately-titled ‘Captivate’, which features a detuned guitar that sounds like a different instrument altogether, somewhere between a broken piano and a rubber ukelele. The off-kilter approach works wonders. While some musicians spend ages hammering out tiny imperfections, here the artist uses them as essential elements of his art. Apparently Calder’s perfect evening involves “unlimited pinball and Bud”, even if his weird reverse-delayed singing on ‘Fatal Delay’ suggests someone who’d probably prefer a palmful of magic mushrooms and a broken kaleidoscope instead. Still, as the sad carousel of ‘Lethargic’ rounds things off, you realise it matters little. Forget the aesthetic, “Time” sounds like it took time to create – and it’s time that’s been well spent. "Woo! Crescendo! " 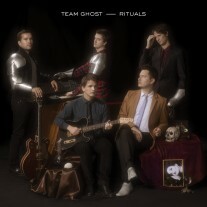 ...is what you imagine Team Ghost exclaiming roughly every four minutes on their debut album "Rituals". The French three-piece, which has expanded to five of late, bloody love a crescendo. This weeks album of the week.